← THE BODY SHOP HAUL. I know I know. It’s June, I get it. 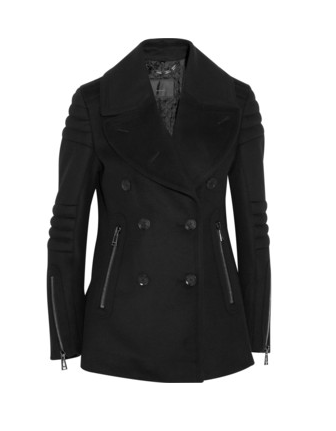 But I just couldn’t help absolutely fawning over this peacoat from Belstaff at Net-A-Porter. It’s absolutely bleedin’ gawgus. I’ve decided to blog about this coat because I’ll never be able to afford the £895 bill, I’ll just admire it from afar with tear-stained cheeks while I wear my Primark togs. Okay, perhaps I’m exaggerating (slightly). Well perhaps not Primark but definitely something about £800 cheaper than this beauty. I just adore the modern take on the classic shape of the peacoat with the zips and shoulder and elbow detailing, it’ll last forever and be in style for eternity. Now, where is my lottery ticket? This entry was tagged 2013, 895, autumn, belstaff, brand, classic, coat, designer, expensive, fashion, lottery, modern, net a porter, online, pea, peacoat, primark, shopping, style, WINTER, wish list, wishlist. Bookmark the permalink.